I had promissed myself to ingore the peaches, apricots, and the colorful plums and move on to tomatoes this week. 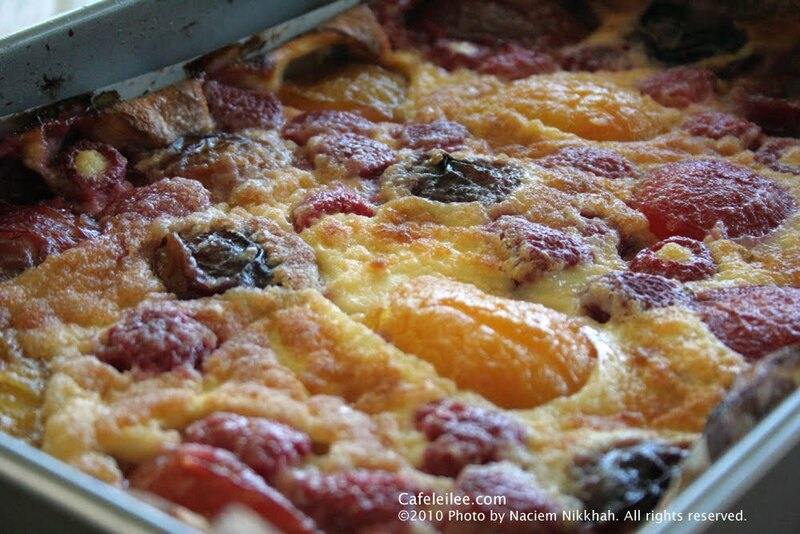 Until I reached the recipe for this Plum and Raspberry Clafoutis in David Lebovitz' The Sweet Life in Paris book. The recipe sounded so easy that tempted me into making the dessert. And the pleasent surprise of a friend bringing us some beautiful and colorfull plums made it easier for me to break my own promiss and go ahead and make the clafoutis anyway. The result is such a light and aromatic dessert that I couldn't resist sharing it with you. Next time I will try the recipe with apricots as suggested by David Lebovitz. Tip: I made a mistake and used wax paper in my baking dish, the clafoutis sticks to the paper and forces you to examine your fork before puting the dessert in your mouth. So omit the wax paper. 1. Position the rack in the top third of the oven. Preheat the oven to 375 F (180 C). 2. Liberally butter the bottom and sides of a 2-quart (2-L) shallow baking dish. Halve the plums, remove the pits, and place them cut side down over the bottom of the baking dish. If the plums are quite large, cut them into quarters. Scatter the raspberries over the plums. 3. In a medium bowl, whisk the eggs until smooth. Whisk the butter and flour into the eggs until completely smooth, then add the vanilla. Whisk in ½ cup (100 g) of the sugar, then the milk. 4. Pour the custard mixture over the fruit and bake for 30 minutes. 5. After 30 minutes, slide out the rack that the clafoutis is resting on (rather than lifting the clafoutis and breaking the tenuous crust that’s starting to form on top) and sprinkle 2 tablespoons (30 g) of sugar over the top. 6. Continue baking the clafoutis for about 30 more minutes, until the custard feels slightly firm in the center and the top is a nice golden brown. Clafoutis is best served warm. کلافوتی یک دسر ساده فرانسوی هست که معمولا در فصل تابستون با میوه های تابستونی درست میشه. این دفعه من این دسر رو با آلو درست کردم ولی کلافوتی با میوه هایی مثل زرد آلو، شلیل، یا هلو هم خوشمزه میشه. بهترین موقع برای سرو کردن این دسر درست موقعی هست که دسر رو از تو فر در میارین. کلافوتی همینطوری خوشمزست ولی اگر خواستین میتونین با بستنی سروش کنید. فقط یک نکته در مورد درست کردن کلافوتی این هست که من اشتباه کردم و از کاغذ روغنی استفاده کردم. پس موقع درست کردن کلافوتی به کاغذ روغنی احتیاج نیست. یک ظرف با حجم ۲ لیتر رو خوب با کره چرب کنید. آلو را نصف کنید و هسته آنرا خارج کنید و آلو ها را ته ظرف بچینید. به شکلی که قسمت بریده شده آلو پایین باشد. اگر آلو ها خیلی بزرگ بودن میتونین به ۴ قسمت تقسیمشون کنید. تمشک ها را روی آلو ها بریزید. توی یک کاسه تخم مرغ ها را خوب بزنید. کره و آرد را اضافه کنید و خوب مخلوط کنید. سپس وانیل، ۲/۱ پیمانه شکر و شیر را اضافه کنید. مخلوط را روی میوه بریزید و داخل فر بگذارید. بعد از ۳۰ دقیقه کلافوتی را از فر خارج کنید و ۲ قاشق شکر باقی مانده را روی آن بپاشد و دوباره داخل فر بگذارید تا برای ۳۰ دقیقه دیگر بپزد تا روی آن هم برشته شود.